Tower Records, one of the bigger music chain stores in the states finally went belly up. They always had a decent selection of jazz/classical and world music even for a snob like myself. There was one near my home that I would poke around in when I did not feel like answering the sweet siren call of the giant Virgin Records mega-store in the city proper. When it was first announced that all Towers were closing, I went in to see what deals there were to be had. Upon asking the cashier how long they would remain open, I was told as long as there is merchandise. It was also unstated but understood that the prices would continue to drop on all products. I was lucky in that what I was after would remain until the last. The final week of the stores existence had an air of a flea market combined with a stock market crash or the sinking of the Titanic. Stuff was all over the place, people seemed to be randomly grabbing things and running towards the registers. As stuff sold out, they would combine store sections and products, closing off the now blank areas of the store. For my convenience, the classical and jazz sections were now combined and squeezed into a corner. There was small semblance of order as to what went where in this now musical hybrid section. Everything was priced to move. I found a boxed set of Brahms symphonies I had, had my eye on forever crammed into the Count Basie slot. 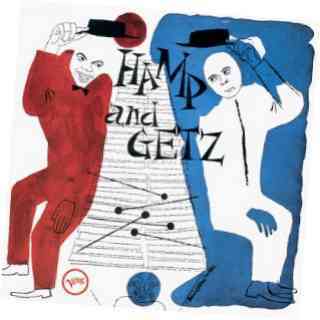 I also found a CD of Stan Getz playing with Lionel Hampton. I knew both their works, and although I had a far from profound knowledge of either artist, it seemed an odd team-up. Priced to move, I grabbed that too. The difference between a vibraphone, xylophone and marimba is fairly simple. Vibraphone came about around 1921 and has metallic keys and a sustain pedal similar to a piano. Its keys are set up similar to that of a piano too. Xylophone uses wooden bars and like the vibraphone has resonators (vertical tubes below the keys) but no sustain pedals. Marimba has no sustain pedals, sometimes no resonators and while it too uses wooden keys, it does not possess as bright a sound as its Xylophone cousin. Red Norvo (1908-1991) was jazzs earliest vibraphonist. He started out on Xylophone/Marimba at the age of 14. Most of the tunes he did, as indeed most of the tunes which utilized these instruments were pop-novelty tunes. Aside from these short lived singles he also led a vaudeville act which incorporated tap dancers and juggling. After cutting his teeth on this tour circuit he joined the NBC Orchestra. It was during this time he made two un-issued albums before joining Paul Whitemans orchestra in the early 30s. It was here that he met his soon to be wife, the singer Mildred Baily. Red and Mildred were known as Mister and Misses Swing. He backed her on her early records while also recording as a leader of his own ensembles. It was not until the 1940s when joining Benny Goodmans band that Red Switched to Vibraphone. It was also during this time that Red became an early proponent of combining music which swung with more complex arrangements which could prove just as satisfying to merely listen to off the dance floor. Red would swing back and forth from coast to coast never seeming to get bogged down in label or genre concerns. It was this open eared philosophy which allowed him to collaborate with the best of what was around. While still with Benny Goodman he cut an album using a sextet among which was both Dizzy Gillespie and Charlie Parker. Part of his bend too was forward thinking. He had a trio of the then unique configuration of bass and guitar featuring two then little known players Charles Mingus on bass and Tal Farlow on guitar. He would tour the world, even backing Frank Sinatra. Despite all the later accolades it is Lionel Hampton (1908-2002) who is considered the first jazz vibraphonist. This was because, initially he had more exposure to larger audiences. Lionel started as a drummer in alto saxophonist Les Hites band. They had a residency at Frank Sebastians New Cotton Club (L.A). It was during a 1930 NBC Studio date with Louis Armstrong Lionel took up the vibraphone after being asked by Armstrong if he could play the one which happened to be laying around the studio. Having had experience with the xylophone Lionel agreed to give it a try. They would go on to record several successful albums together. Although he would still play other instruments (drums and piano which utilized a unique two finger technique) on record and stage it was vibraphone and the way he made it swing that Lionel became famous for. In the 1930s during a West coast tour John Hamond brought Benny Goodman to check Lionel out. This was the start of the Benny Goodman Trio with Teddy Wilson on piano. Eventually Gene Krupa was hired on drums to make it into a quartet. They were one of the first multi-racial groups to play before large audiences. This band would expand further into an orchestra. Lionel would make his own recordings often utilizing various configurations of band-mates he had on hand. In the early 1940s Lionel set out to form his own band. His band became a third ivy league university of jazz, enlisting all the greats of the day who were not with Count Basie or Duke Ellington (sometimes actually having former members of the other ensembles such as Charles Mingus who was briefly also with Duke Ellington). The pedigree of those who had passed through Lionels ranks is impressive, including such jazz luminaries as Dexter Gordon, Johnny Griffin, Illinois Jacquet and Fats Navarro. Perhaps Lionels most famous composition was Flying Home (1939) which featured an extended bar walking solo by Illinois Jacquet which was a precursor to R&B. Having started out at the age of sixteen, Lionel achieved many accomplishments. He would star in several movies, compose scores too. He was a member of Alpha-Phi-Beta, the first intercollegiate Greek letter fraternity for African Americans. At one point he served on the human rights commission in New York while also having played for several U.S presidents including Harry Truman. The United Nations further honored him by naming him Ambassador of Music (1985). 1995 saw him being awarded the National Medal of the Arts. I have a large music library and one thing I have always been proud of is that every CD, one bought a decade ago, still means as much to me today. Often too as times goes by I find new things to enjoy from an album as I get into more of the people on the session who are the sidemen. I will buy a Lee Morgan album to hear one of the best splatter school trumpeters. As I listen, I hear the whole song but am zeroed in on him. Down the line I will get into pianist Harold Mabern and realize I already have twenty albums he is on. When this happens its almost as if I have just gotten twenty new albums. As much as I still enjoy all my old albums I do get caught up in the quest, the constant search, not for novelty but exploration for its own sake. The advent of the net allows for obscure/deep music to be made more available, if not always cheap, Japanese imports of all the cerebral heavy-weights such as Anthony Braxton, Cecil Taylor et all can now be had. Delving into these deep waters it is easy to forget the simple joy to be had from hearing standards done well and with-in the confines of normal song structure. Lionel Hampton spent over half a century on the road. He was a musician, but also an entertainer and to him such a label had no aspect of the sycophant about it. What is interesting and fairly unique to the vibraphone in jazz is there were no radical departures in sound or how it was played. Three altos from various parts of the country or different generations would sound drastically different, while the first three vibraphonists Red Norvo, Lionel Hampton and Milt Jackson each had there own style, there was never any radical departures. It really was not until Bobby Hutcherson that some new aspects of the instruments possibilities began to appear. Lionel played in ensembles of varying size, but he never had artistic phases of drastically different sounds/feel/mission. Just good music done for the enjoyment of all. Although of different eras he shared this in common with Stan Getz (1927-1991). Stan Getz was nic-named The Sound for his rich-creamy tone. Only Stan Getz (and maybe, Zoot Sims) managed to sound romantic, yet retain their coolness. One hand offering the girl flowers while the other reaches for a drink. An urbane grace which also knows the blues. Stan was a multi-instrumentalist who received his first saxophone at the age of 13. At this young age he was accepted into band leader/trombonists Jack Teagardens orchestra. From there he would work his way through some of the best big bands the nation had to offer. Stan would be employed by Stan Kenton, Jimmy Dorsey, Benny Goodman and as a featured soloist for Woody Herman. Stans solo would contribute to a hit on Ralph Burns Early Autumn(1949). It was during these early years on the road and in the studio too that Stan would face some of the same narcotic demons off and on over the years, which seemed to plague many of the greats of jazz. When one takes this into consideration along with his one pack a day cigarette habit and temper, his tone and chops seem all the more impressive. Propelled forward with this fame, Stan would now largely appear as leader on recording dates and mostly the big band format would be pared down to smaller, more modern configurations. He played with the whos who of up and coming jazz. The late 50s saw him move to Europe where he frequently played with fellow expatriates and members of the European jazz community. It would be several years before he would then return to New York. The late fifties saw jazz in a great state of flux with the advent of Free-jazz, Modal and Hard-Bop all emerging within fairly rapid succession of each other. Guitarist Charlie Byrd returned from a state department sponsored tour of South America. He brought back with him bossa-nova records, the songs of Jobim, author of what are now many standards of the repertoire. Stan Getz was instantly hooked on the infectious rhythms and the possibilities of seamlessly merging a melancholy romanticism. Their first album together introduced what would become a grammy winning huge hit, Desafinado. Stan would go on to record another even more compelling album utilizing the composer on piano and vocalist/composer/guitarist Joao Gilberto. This album would spawn the huge hit Girl from Ipanema. These two albums would guarantee steady financial rewards for Stan for the rest of his life. The money made from these records and some new standards for musicians, to now make their own, proved a powerful temptation to lots of musicians at this time, the bossa-nova beat creeping into many recordings. With the scent of money in the air, this then exotic/unique music became watered down and homogenized for mass consumption. Soon every middle class wood paneled rumpus room had muzak-tinged sambas and bossa-novas playing as suburbanites enjoyed their cocktails. Two interesting things concerning Stan Getzs bossa-nova albums. He actually made many more both before and after the fact, but it is these two albums the jazz lay-man knows him for. A brilliant career, fly-like, trapped in amber. Also, although I had heard his bossa-nova albums, going back and re-listening to them now, I discovered they were not even close to the muzak inflected grooves I vaguely recollected. Talking to another jazz snob, then having him listen, the same phenomenon was experienced. It was as if these albums, which aside from being legitimate art are still a joy to listen to, had merged with the identities of all the out right samba kitsch which would follow. The Hamp and Getz session was a 1955 studio session. It came about when both Lionel Hampton and Stan Getz found themselves appearing in the movie The Benny Goodman Story. Stan had the big band background and Lionel Hampton had always been progressive, with big ears. There was no hindrance connected with genre considerations. The set is made up of mostly standards with one Lionel Hampton original. There is a ballad medley, a device very much of Lionels generation perfected by him and his peers, Duke Ellington and Count Basie, that allowed these road warriors to give the audiences all the songs they came to hear within the time constraints. The Autumn in New York section of the medley achieves that subtle beauty one may encounter during a sun set or occasionally from the city itself. The whole band is good, no weak links. Lou Levy (piano) had played off and on with the rest of the rhythm section on various dates and adds a layer of depth to the over all sound without ever letting the listener forget whose session it is. Such lack of ego would by the late fifties become rarer when not involving boredom. The drums have just the right amount of bounce to marry their sound to that of Lionels vibes. Perennial West Coaster Shelly Manne was a multi-instrumentalist (and club owner Mannes Hole). He would be one of the first jazz cats to record what would become known as world music. The knowledge he gleaned from having also been a leader in his own right combined with techniques of multi-instrumentalist allowed him to appear on recordings by players of all the various schools and never sound out of place. Leory Vinnegar too had made cross genre appearances and his tone here is warm and rock-steady without ever giving the feeling of just marking time. Stan Getz, like Lionel never had drastic departures artistically from what he did so well. The sizes of his ensembles would occasionally change, but over all to know and enjoy one album by him is to know the body of work. While his style and choice of solo statements remain totally his own, one does detect an added Joie De Bleu during this foray with Lionel. Lionel himself sounds fantastic. I much prefer him in smaller settings. And beyond that, I much prefer him in such relaxed and swinging setting. No gimmicks, no pressure, really allowing him to create a bright percussive joy. The lead track Cherokee best illustrates this. What had by this time become one of bops anthems here shines with a different sophistication, without sacrifice of modern energy. The CD has been remastered from mono tapes and includes two previously unreleased tracks. The sound through out the CD is very good with each track averaging about six minutes. There are some new liner notes along with the original reproduced. Music that one knows well and treasures can be an inspiration, a comfort and sometimes even a friend. There is never anything wrong with making a new friend.